This course will demonstrate the concepts of 3D mechanical modeling and simulation and how Wolfram SystemModeler can be used for your product development. During the course you will develop a model of a milling robot, using components from the Modelica MultiBody Library. 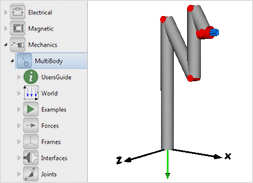 You will also learn how to connect the 3D mechanical components with 1D transitional and rotational mechanics, as well as get familiar with designing control systems in Wolfram SystemModeler. The course is presented in a series of alternating sessions with exercises and class discussions on crucial topics, smart hints and tips that help you become an efficient modeler. This course is for those who are interested in modeling and simulating complex mechanical systems. Basic familiarity with SystemModeler is recommended. Experience with 3D modeling is not required, as these concepts are taught during the course. Create custom 3D components that can be reused across your model. Learn the workflow for creating multidomain models. Start from scratch and work toward a complete model to see how each step can be visualized and how it contributes to the model as a whole. Custom visualizations of simulation results from SystemModeler and model diagrams change depending on simulation results. Explore how built-in visualizations augment simulations.